ThermIIC is a temperature-logging program for Acorn RISC OS, central to a series of articles that appeared in Acorn Archimedes World magazine. Using Dallas Semiconductor DS1624 or DS75 I²C thermometers, ThermIIC can measure up to eight temperatures simultaneously and log them to CSV files. 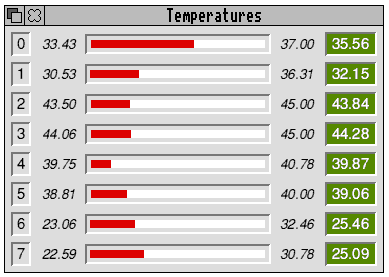 Temperatures are also broadcast to other applications by means of the RISC OS messaging system. ThermIIC was released on the cover disc of Archimedes World, volume 15, issue 8. I am also making it available locally. On the download page is version 1·22. The ThermIIC series is now available from this site in Acrobat format. See the table below. These files were produced from my original Impression documents, prior to "subbing", via postscript, Adobe Acrobat and ps2pdf. Some of the figures look better printed than on-screen. ThermIIC 1.24 writes latest results to ThermIIC$Logged system variable, in log line format. This was added to simplify CGI scripts. I am experimenting with a Netscape 6 / Mozilla MySidebar CGI program. The latest ThermIIC application has support for the Baildon Electronics enhanced I²C module, allowing operation at different bus speeds. This might be of use if you find you get many bus communication failures (temperature read-outs get greyed-out) because of a long bus or wires with a lot of capacitive coupling. Slowing down the bus is likely to help. To do this, download the Baildon module (thanks to Baildon Electronics for permission to include the module here) and load it with your boot sequence. ThermIIC will detect the module, and allow you to enter a speed parameter in the setup window. Bigger numbers (up to 127) give lower speed. I understand that RISC OS 4 has an updated I²C module. If anyone has tried ThermIIC or FanatIIC with this, please tell me how they did. ThermIIC now has support for "75"-type sensors. I have done tests with a DS75 (thanks to Dallas Semi for some samples), which allows resolutions of up to 12-bit. The 9-bit mode should work with the original LM75, and I'd be very interested to hear from anyone who could try it for me. The new Dallas DS1775 sensors, which have no address pins, should also work. Part 5 was about TherMon and ThermGif (which uses the GD library). Although this article is not being published, a related work was just published in Acorn User (Christmas 1999 issue). This discusses data collection over the world-wide-web, and on-the-fly gif file creation. Part 6 is another hardware project. This one is called FanatIIC, and as you might guess from the name, it drives fans (although you could drive other things too, especially with relays). The software half of the project uses a set of rules (temperature set-points and proportional factors) to control the fans according to the temperatures read by ThermIIC. Since this article did not get into print at all I have made it into html and uploaded it to this site. If you're interested in weather monitoring, or the length limitations of the I²C bus are troublesome, take a look at my Oww project.